There are tons of different recipes for keto bulletproof coffee, but I try to keep it simple. This post is sponsored by Omega Power Creamer and contains affiliate links and a discount code. The morning is my busiest time of day. I wake up and make the kid’s breakfast each morning before they head off to school. The problem with that is my hanger starts to kick in about ten minutes after my feet hit the floor. I don’t like waking my kids when I’m hangry which is why I love Omega Power Creamer. While everyone else is making complicated keto bulletproof coffee, I’m over here sipping my coffee seconds after it finishes brewing because my creamer rocks! I don’t have time to pull out all the oils, butter, and fats when making my morning fuel; I need quick and easy. 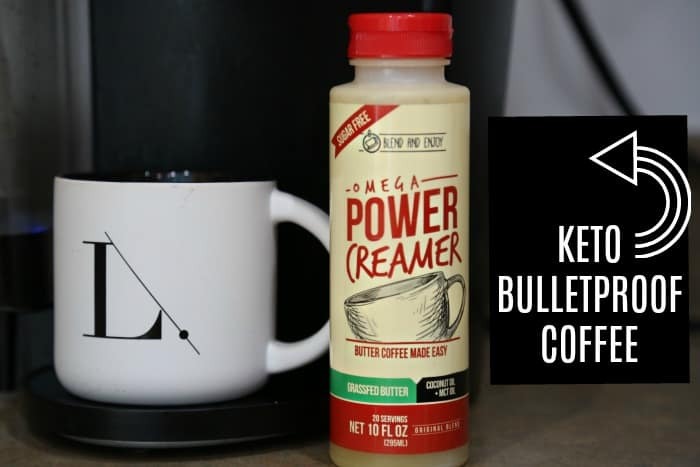 Omega Power Creamer is everything I look for in the perfect fatty coffee. All in one easy to squeeze bottle! Just measure and go! Power Creamer is Lactose-free, Casein-free, Gluten-free, and Carb-free and it mixes like a dream! I tried the ButterCoffee Creamer in Original, but now they have Vanilla and Cacao! You better believe I will be trying those ASAP! All three flavors are available on Amazon, and you can save 15% off using code ketosize! I didn’t even know you could enter promo codes on Amazon, but you can (just enter the promo code when you go to check out). Keto Bulletproof Coffee Creamer: Why Drink Fat? Keto Bulletproof Coffee is a great way to get the healthy fats your body needs first thing in the morning. Remember on keto your body is literally running on fat so you NEED fat in your diet and after fasting all night keto bulletproof coffee is a great way to start the day. Running on fat means you experience less brain fog, less and eventually no carb/sugar cravings, and the best side effect keto has to offer; weight loss. Sometimes I’m still a little in awe of the fact that I eat fat and lose weight. I hear from keto newbs weekly who are struggling to eat enough fat every day, and keto bulletproof coffee is the BEST way to alleviate that problem.